12:01 a.m. to 11:59 p.m. Tues. to Sat. incl. 12:01 a.m. to 1:30 p.m. Sun. 6:30 a.m. to 11:59 p.m. Mon. Northward trains must obtain terminal clearance at Don. Don is an initial station for No. 409. When operator not on duty, train register will be in waiting room, which will be locked with bar placed on door and secured with C.P.R. and C.N.R. switch locks. Door must be kept locked. Operator, when on duty, register all trains. Trains between Leaside and Don and between Don and Toronto will be governed by Toronto Terminals time table. Trenton Division train dispatchers will issue train orders between Agincourt and Don when ncessary. 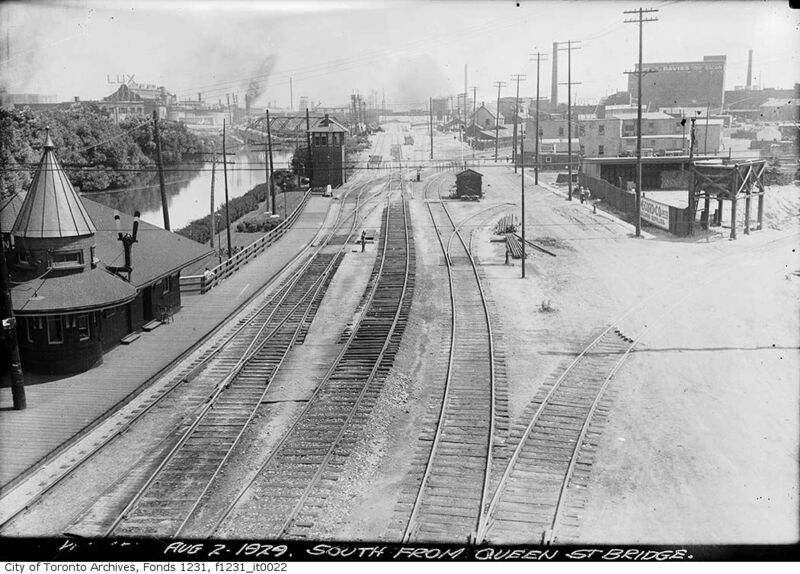 1910-09-18 Appears as Queen Street (flag stop) in C.N.O.Ry. time table CNOR.21, p. 3 . 1917-09-17/1920-05-02 Appears as Don (Queen St. E.) in C.N.O.Ry. and C.N.Rys. time tables CNOR.EL.OD.TD.12, p. 3; CNR.EL.OD.NOSTD.3, p. 3 . 1920-06-27/1921-05-01 Appears as Queen Street in C.N.Rys. time tables CNR.EL.OD.4, p. 3; CNR.EL.OD.NOSD.15, p. 11 . 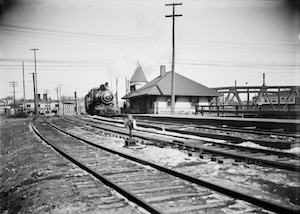 1927-01-02/1931-09-27 Appears as Queen St. C.P.R. Depot in C.N.Rys. time tables CNR.CR.NOD.19/37 . 1931-11-22/1961-10-29 Appears as Don in C.N.Rys. time tables CNR.CR.NOD.38/28; CNR.GLR.NOA.29/32 . 1967-12-05 C.P.Ry. closes Don station U.C.R.S. Newsletter No. 263 (1967-12), p. 177 ..
TRL Canadian Historical Photo Collection/Joseph Adamson Blakey, Acc. 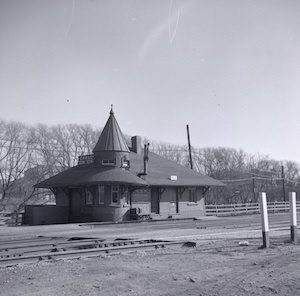 : N 1-456 Station. 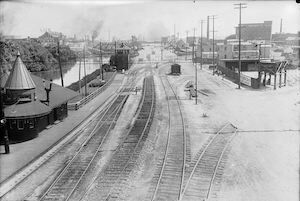 City of Toronto Archives, Fonds 1231, Item 22 Looking south from Queen Street E overhead bridge during track laying of approaches to the viaduct . The trackwork will be reconfigured and the interlocking tower removed in a couple years when the Cherry Street interlocking is completed. Note that the Consumers Gas bridge across the Don River north of Eastern Ave has collapsed. TRL Canadian Historical Photo Collection/J. V. Salmon Collection, Acc. : S 1-4017a Station.